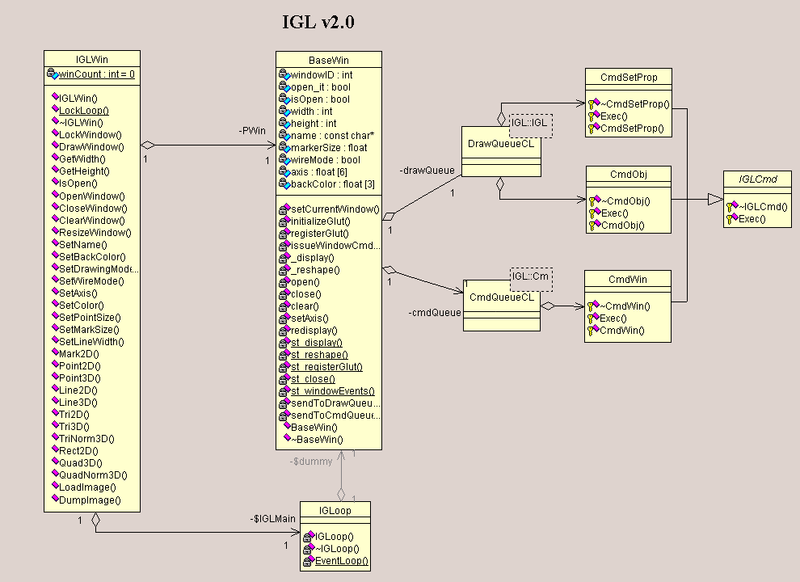 The IGL is a small cross-platform C++-library for displaying everyday-tasks in mathematics and provides a multithreaded C++-Interface for GLUT. 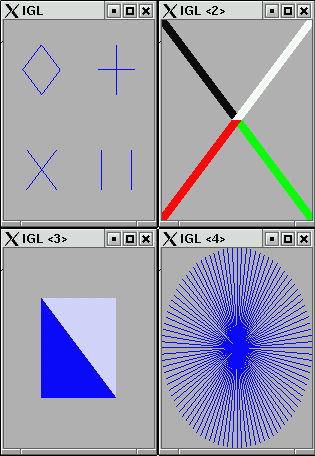 At the IGPM it is used for generating graphical output of numerical implementations (solving equations, integration, splines, etc.) in a beginners C++-Programming Tutorial. Providing an object-oriented abstraction layer for openGL (which has become the cross-platform standard for almost all operation systems) it offers the basic functionality of rendered vectorgraphics. On the other hand it has a small User-Interface that satisfies the needs for a novice C++-Programmer. IGL is designed for displaying static Graphics, if you are looking for an advanced environment that also allows real-time rendering, GLT might be a better choice. Roughly spoken, IGL serves as a object-orientated Wrapper for GLUT. The context-orientation (said to be the "poor man's object orientation") of the window management is wrapped by creating an object for each window-context comprising all the data and callback-functions needed. The Design of IGL differentiates between the Interface, the IGLWin-Object (declared in the 'public' header IGL.h, defined in IGLWin.cpp) and the Implementation, the BaseWin-Object (declared in BaseWin.h, defined in BaseWin.cpp). The two Objects communicate through a tiny Event-System as noted below. When IGLWin receives a method call (for example Line2D(0,0,1,1);) it generates an event (in this case a CmdObj) and appends it to the corresponding queue (in this case the drawQueue) of BaseWin. BaseWin has two queues, the cmdQueue and the drawQueue. The cmdQueue stores the Window-Operations (Open, Close, Clear, Resize, Redraw) represented by CmdWin and is emptied every WINDOW_REFRESH_TIME (defaults to 0.1s) by a timer-function. The drawQueue stores all the drawing Commands and keeps them until a Clr (via cmdQueue) is issued. Whenever the Window needs to be redrawn, the drawQueue is iterated (but not emptied) and each Command (CmdObj or CmdSetProp) is executed. Whether a window needs to be redrawn is determined by the GLUT Event-System, to which control has been handed over by glutMainLoop(). The object-oriented wrapper of the glutMainLoop() call is the IGLoop (IGLoop.h, IGLoop.cpp). This is a private static variable of IGLWin which is initialized, when its first Instance is constructed. It then creates a separate thread and calls the never-returning glutMainLoop() which issues all the window-related callback-function calls of GLUT. For bootstrapping, an invisible dummy window has to be created, which is a private member of IGLoop and plays no further role after initialization. If all this is of any use to you, I would be happy for a short comment.